colony who made it there home in the 1880s. John Singer Sargent paid his first visit to Broadway in September 1885 to recuperate from a bad head wound received while diving from a weir. He had been invited to go to this little Worcestershire village by his friend, the American painter Edwin Austin Abbey. Broadway, then little known and remote from the railway, was the home of a small colony of artists, many of whom were, like Sargent, expatriate Americans. It was here that Sargent painted what was later to become one of his best loved pictures, Carnation, Lily, Lily, Rose. Broadway was 'discovered' by the American illustrator and painter Francis Millet, in 1885 It was then - and still is - an idyllic spot at the extreme south-eastern corner of Worcestershire, tucked into the foot of the Cotswolds overlooking the Vale of Evesham. Its long main street, lined with 16th and 17th-century stone cottages, leads to the village green. The last few decades of the 19th century had witnessed a vogue for artists' colonies. In Britain alone, groups of artists gravitated to remote parts of the country where they could work in picturesque rural or romantic surroundings, well away from the dirt and the noise of the cities. Around the time that Broadway was in its heyday, other artists had occupied Newlyn in Cornwall, Whitby in Yorkshire and Walberswick in Suffolk. Echoing the French Impressionists, much of whose work was painted in the countryside, artists in England aimed to capture the fleeting effect of light and shade in pastoral surroundings. Francis Millet and his family first moved to Farnham House, which overlooked the village green in Broadway. They acquired this along with a l4th-century monastic ruin known as Abbot's Grange which they restored and converted into a studio. Millet was soon joined by a host of English and American friends, namely the painters Edwin Abbey, Sargent, George Boughton, Alfred Parsons (illustrator of Dickens' work and renowned 19th-century artist and garden designer), Edwin Blashfield, the English illustrator Fred Barnard and the writers Henry James and Edmund Gosse. When visitors came to stay, they frequently lodged at the Lygon Arms, a dominating and beautiful former 16th-century manor house at the edge of the Green. Sargent stayed there at first, as did Abbey, who used some of the details of the building in the background to his illustrations to Goldsmith's play She Stoops to Conquer. Music was a great source of pleasure to the friends. Abbey wrote, 'We have music until the house won't stand it. Sargent is going elaborately through Wagner's trilogy, recitatives and all ... Miss Gertrude Giswold sings to us like an angel.' There are also tales of games and dancing:'We really do have a gay summer, pretending to work and sometimes working ... until four, and then tennis until dinner time, and after dinner, dancing and music and various cheering games in the studio, but mostly dancing.' In such a frivolous atmosphere it is hardly surprising that the community were fundamentally artificial, and eventually this became apparent. Abbey had met his wife, Mary, in 1888, when they were both guests of the Millets at Russell House in Broadway. They went to America together, returning as a married couple in 1890, but not to so sunny an atmosphere as before. Mary, who was an outspoken, dominating woman and rather frosty her manner, felt the unbuttoned communal lift at Broadway was not sufficiently serious for her husband. She even doubted that the others had the appropriate respect of Abbey's work. And she wanted to be mistress in her own home. During his stay in America Abbey had, with Sargent, been commissioned to paint a large mural cycle for Boston Public Library. He had planned to execute these in Broadway, but his wife had other ideas. 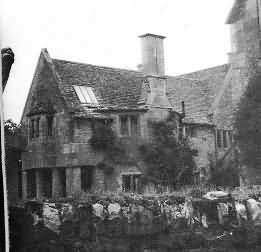 Instead of remaining with the community, and their narrow, illustrators' horizons, Mary and Edwin Abbey bought an old English country house in Fairford, 40 miles south of Broadway. There they were followed by Sargent, and, in time, by Henry James. The heart, and the major artistic driving force, were thus removed from Broadway, and as an artistic community it faded.